was composed by St John Berchmanns, SJ. He prayed it daily to obtain Mary's intercession. His desire was to never commit any sin against the virtue of purity. 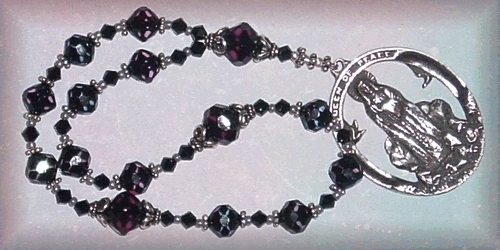 See our newest Immaculate Conception chaplets in the catalog ! Celestial blue abounds in this one-of-a-kind rosary! The 9mm vintage Aves play a starring role --- blue opal givre shimmers with aurora borealis finish, accented by Swarovski spacers. The sterling-capped Paters are 12mm firepolish of sky blue luster. The striking centerpiece entwines the initials of Ave Maria around Our Lady of the Immaculate Conception. The rosary is completed with stunning openwork sterling crucifix. This chaplet honors the 150th anniversary of the Immaculate Conception, and St. John Berchmanns, SJ, author of this chaplet, with a special medal featuring St. John (above) and Our Lady on the obverse (see below). Note: St. John Berchmanns is the patron of altar-servers. A bouquet of roses for Our Lady! The Aves are 8mm cloisonne, scattered with roses. The Paters are 12mm handmade lampwork, roses swirling over gold-dust. The chaplet is completed with a special 1.25" bronze medal, cast from an antique. with pamphlet describing the chaplet prayers . A summer bouquet for Our Lady! Blue lace agate swirls with ethereal clouds like those which lifted Our Lady into Heaven. 10mm faceted rounds are complemented with 15mm handmade lampwork beads, lush with wild roses. This limited edition chaplet is completed with an exquisitely detailed 1.5" sterling medal of the Assumption. Here in New England, August brings a countryside swathed in purple! August is dedicated to the Immaculate Heart of Mary, so I offer her this summer bouquet! The Paters beads, handmade lampwork, capture the vivid blossoms, just now appearing in the marshes. The Aves are 7mm Swarovski in an ethereal Tanzanite color. The rosary is joined with a bronze centerpiece featuring the Sacred Heart, with St. Rita (shown) on the obverse, and completed with a magnificent 1.5" bronze medal of the Immaculate Heart of Mary, cast from an antique. A special centerpiece honors the 100th anniversary of the dogma of the Immaculate Conception! Cast from this 1954 piece, a detail from Murillo's Immaculate Conception is featured on side; on the obverse are the Popes Pius of 1854, 1904, and 1954. The Aves are 8mm amethyst firepolish with a gold picasso luster (barely evident in the photo); in the bronze-capped 25mm Paters, roses swirl over silver foil, encased in royal amethyst. 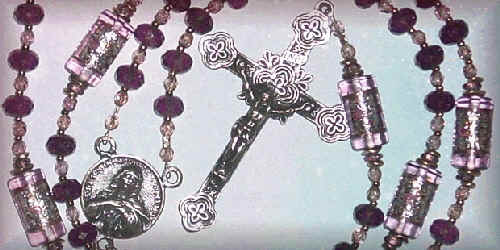 The rosary is completed with a magnificent 3" bronze crucifix. "And there appeared a great wonder in heaven, a woman clothed with the sun, and the moon under her feet, and upon her head a crown of twelve stars." This Crown of Twelve Stars is resplendent with 12mm glass stars of celestial blue, shimmering with alexandrite AB finish. The stars are complemented with sterling-capped 15mm crystals in alexandrite AB finish. The Chaplet is completed with an exquisitely detailed 1.5" sterling medal of the Assumption. Shimmering blue chalcedony whispers of clouds which lifted Our Lady into Heaven. The polished 12mm facetted nuggets are complemented with sterling-capped handmade lampwork beads featuring cameo-like white roses. This limited edition chaplet is completed with an exquisitely detailed 1.5" sterling medal of the Assumption. written by His Holiness, John Paul II. This chaplet is offered in memory of John Paul II, and symbolizes the light he brought to the world, and the sorrow left by his passing. Swarovski crystals of extraordinary cosmo jet capture both luminescence and darkness in shades of light sapphire, amethyst, and rose, veiled with black. The Aves beads are 8mm, and the sterling-capped Paters are 10mm. Mary is represented by an exquisitely-detailed sterling medal of Our Lady of Fatima: the kneeling children, the blades of grass, the fluffy cloud, and even the beads of Our Lady's rosary. The mission that God wanted to entrust to St. Catherine was made manifest to her on the Saturday before the first Sunday of Advent. 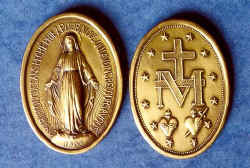 It was the mission of making and distributing the Medal of the Immaculate Conception, now known as the Miraculous Medal. That day was November 27, 1830.
the Son and the Holy Spirit - Amen"
of the Blessed Virgin Mary"
St. John, the beloved disciple of Jesus and Mary, was privileged to behold a wonderful sign in Heaven: "A woman clothed with the sun, and the moon was under her feet, and upon her head a crown of twelve stars." This gave rise to the Crown of Twelve Stars devotion which Heaven has blessed with countless favors. R. Amen. Say Hail Mary, and Gloria. thou art the honor of our people. V. Remember thy congregation * , O Mary. R. Which belongs to thee from the beginning. of so great a work. (to be said for the Holy Catholic Church, for the propagation of the Faith, for peace among Christian peoples and the extirpation of heresy). composed by His Holiness, John Paul II. 12. Let me live in you and keep me in this union always. The night of July 18, 1830 was a night that changed the history of the world. It was the night that the Blessed Virgin Mary ushered in the modern Marian era. It had been almost 300 years since the apparition of Our Lady of Guadalupe in 1531. This night in 1830 Our Lady’s apparition began a series of Marian apparitions, manifestations and ecclesial events that were to succeed one another down to our own day. We can very well see why Pope Paul VI declared, "Our era may well be called the Marian Era." Catherine heard the voice telling her, "Have a medal struck after this model. All who wear it will receive great graces. They should wear it around the neck. Graces will abound for persons who wear it with confidence." So this was the mission entrusted to Catherine: to see to the making of this medal and to spread its use. During 1830 and 1831 this vision of November 27 was repeated some six times to encourage Catherine in fulfilling her mission. She had to suffer much for this cause; first in trying to get the medals made, and then in trying to keep herself hidden, which she did for forty-six years till she died in 1876. The first two-thousand medals were delivered on June 30, 1832. The spread of the Medal was almost like a miracle in itself. The first supply disappeared very fast. Pope Gregory XVI put one of them at the foot of the crucifix on his desk. The Redemptorist Founder of the Sisters Servants of the Immaculate Heart of Mary in America, Fr. Gillet, had the design of the medal placed on his ordination card in 1836. The stories of the cures and wonders of the medal helped to spread its use far and wide. By 1836 the firm of Vachette had sold several million medals. Eleven other engravers in Paris had done the same. And four engravers in Lyons were hard pressed to meet the demands for the medal. Another of the stupendous workings of the Miraculous Medal was the conversion of Alphonse Ratisbonne on January 20, 1842. On January 15 he had been prevailed upon to wear a Miraculous Medal and say the "Memorare." Alphonse was a staunch Jew, and had great antipathy for Catholicism. Yet on that day of January 20 he saw an apparition of the Blessed Virgin of the Miraculous Medal in all her dazzling glory, and his whole life was radically changed. Cardinal Patrizi, the Vicar of Rome, after a careful investigation, received Alphonse into the Church on January 31, 1942. Baptizing him, confirming him, and giving him First Communion. Alphonse became a priest and spent some thirty years in the Holy Land as a missionary to his own people. 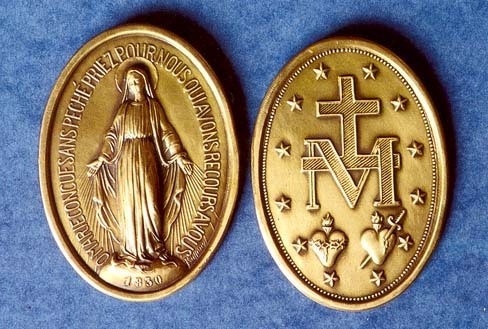 On the medal we see Mary Immaculate with her foot crushing the head of the serpent. "She who as the one ‘Full of Grace’ was brought into the Mystery of Christ in order to be His Mother and thus the Holy Mother of God . . . remains in that mystery as ‘the Woman’ spoken of by the Book of Genesis (3:15) at the beginning . . . " ( Mother of the Redeemer , #24, p.23; Pope John Paul II; March 25, 2007). In many other official documents of the Church and writings of Saints we find Mary referred to as this Victorious Woman of Genesis destined to crush the proud head of the devil. "The Bible is replete with the mystery of the Savior, and from Genesis to the Book of Revelation, also contains clear references to her who was the Mother and Associate of the Savior." ( Marialis Cultus , #30, p.28; Pope Paul VI; Feb.2, 1974). Mary’s hands are shown showering a cascade of brilliant rays on the world, as if she found them too heavy with graces and was eager to pour them on us. We can see her as our "Advocate, Auxiliatrix, Adjutrix and Mediatrix. Of this intercession of hers for the People of God with the Son, the Church has been persuaded ever since the first centuries . . . " ( The Great Sign , Part I, p.4; Pope Paul VI; May 13, 1967). It was also at the foot of the Cross that Jesus gave us, in the person of the Beloved Disciple, His own Mother to be our Mother. "Woman, behold your son; son, behold your Mother" ( John 19, 25-27). And the beloved disciple gives us an example to follow, so that we learn to take Mary into our homes, into our lives, into our hearts, as do loving children. Since the Cross is the symbol of Christ’s Redemptive Sacrifice, we can also see a Eucharistic symbolism on the Medal. "To perpetuate down the centuries the Sacrifice of the Cross, the Divine Savior instituted the Eucharistic Sacrifice [the Mass], the Memorial of His Death and Resurrection, and entrusted it to His Spouse the Church" (cf. II Vatican Council, Sacrosanctum Concilium , #47), which the Church continues to do "in union with the Saints in Heaven, and in particular with the Blessed Virgin." ( Marialis Cultus , #20, p.19-20; Pope Paul VI; Feb. 2, 1974). In every Eucharistic Liturgy the Church involves the Blessed Virgin Mary, so befitting to her who stood heroically at the foot of the Cross uniting her sufferings to the Sacrifice of her Son, filling up in her body those things that are wanting to the sufferings of Christ, for the sake of His Mystical Body, the Church. (cf. Col. 1:24). In all of the approved apparitions of Our Lady there is a Eucharistic thrust. She usually asked for a church to be built, in which the Eucharistic Sacrifice and the Blessed Sacrament always have prime place. Mary always leads us to Jesus, and Jesus is especially present in the Eucharist. Hemos querido compartir con ustedes, las oraciones a la Virgen de los Rayos, conocida también como la Virgen de la Medalla Milagrosa. Las oraciones se irán mostrando en las distintas páginas. Se incluyen la novena a la Virgen de los Rayos, el triduo (tres oraciones), la oración de Juan Pablo II y la novena a la Medalla Milagrosa. Recuerden que la medalla no es un amuleto, no es un talismán, no es para la suerte, sino que es una responsabilidad en nuestras vidas. Son numerosos los milagros que a través de la Virgen se hacen todos los días. Lo importante es pedirlos con mucha fe. La Virgen ha sanado a muchas personas, a conseguido embarazos imposibles, trabajos para los desocupados, etc. La Santísima Virgen se comunica con Catalina Labouré. En 1830 Francia atravesaba uno de los períodos más cruciales de su historia. Una nueva revolución era inminente, y la monarquía de los Borbones, recientemente restituida, estaba en peligro. Tal era el clima que se respiraba en París cuando la Santísima Virgen se apareció a Catalina Labouré (1806-1876), novicia de las Hermanas de la Caridad de San Vicente de Paul. La noche del 18 de junio de 1830, fue la escogida por la Virgen Santísima para hacer entrega de sus cartas credenciales a la Venerable Hermana. Era tanto mi deseo de ver a la Virgen, que me acosté con la confianza de que San Vicente había de conseguírmelo de la Señora. Serían no más que las once y media de la noche, cuando oí que me llamaban: "Hermana. Hermana, Hermana". Desperté; miré del lado por donde la voz venía. Corrí la cortina; y vi a un niño, como de cinco años que vestía de blanco; y así me dijo: "Ven a la capilla, que allí te espera la Virgen". Tranquilizada por él, dime prisa en vestirme; y le seguí… No pequeña fue mi sorpresa, viéndolo todo iluminado como en la misa de Navidad. Sin embargo, la Virgen no se veía por ningún lado. Arrodillada, esperé un largo rato, con miedo de ser descubierta. Llegó la hora. Y el niño me previno con estas palabras: "Mira, ahí tienes a la Virgen Santísima". Noté como un roce de sedas que se dirigía al lado del Evangelio, a un sillón que allí había donde normalmente se sentaba el sacerdote. Era la Virgen, quien se me ofrecía sentada. Creo imposible describir cuanto veía y ocurría en mi: algo así como un temor de verme engañada; y de que aquella a quien yo veía, no fuera la Santísima Virgen. Mas, el ángel de mi guarda -que no era otro el niño- me increpó un tanto severo y sin más dudar, me arrodillé junta a Ella y puse mis manos en su regazo"
Y allí, mano a mano, como de Madre a hija, "quiero, hija mía, nombrarte por mi embajadora. Sufrirás no poco; mas vencerás, pensando ser todo para la gloria de Dios. Con sencillez y confianza di cuanto entiendas y veas". «Este globo que ves representa al mundo entero, especialmente a Francia... y a cada persona en particular. Estos rayos son el símbolo de las gracias que derramo sobre las personas que me las piden». En aquel momento se formó en torno a la Santísima Virgen como un marco, un poco ovalado, en el que estaban escritas en letras de oro estas palabras: «Oh María, sin pecado concebida, ruega por nosotros que recurrimos a Ti». Entonces se dejó oír una voz: «Haz acuñar una medalla según este modelo. Las personas que la lleven recibirán grandes gracias; las gracias serán abundantes para las personas que tengan confianza...» Algunas de las piedras preciosas no despedían ningún rayo de luz... «Estas piedras que quedan en la sombra significan las gracias que se olvidan de pedirme». Al instante pareció que el óvalo daba la vuelta. Vi el reverso de la medalla; la letra M coronada por una cruz; debajo, dos corazones, uno rodeado de espinas y el otro atravesado por una espada”. La Medalla fue acuñada por primera vez en 1832 por el confesor de Catalina, el Padre Aladel, con el permiso del Arzobispo de París. Apenas sor Catalina la tuvo en sus manos, dijo: "Ahora hay que difundirla", y exhortaba a llevarla con "devoción y confianza". Muy pronto la Medalla dio grandes frutos de conversión y se la llamó “La Medalla Milagrosa”. La Medalla encierra en sí, con su maravilloso simbolismo, toda la historia de la salvación, a la que María está definitivamente unida. Ella es la ‘mujer’ del Génesis, la que aplasta la cabeza de la serpiente. Ella está unida a la cruz de su Hijo: La “M” está coronada por la cruz. Ella es ‘la mujer vestida de sol que San Juan Evangelista describe en el Apocalipsis: Sus pies reposan sobre un semicírculo blanco, y la corona de doce estrellas, símbolo de la Iglesia de Jesucristo, circunda la “M” y los dos corazones ofrecidos por la salvación de la humanidad. Los rayos salen de sus manos porque Ella es la mediadora de las gracias que el mundo necesita para volver a Dios. La Oración: “Oh María, concebida sin pecado...” indica su privilegio de ser la Inmaculada Concepción. “...ruega por nosotros, que recurrimos a Ti”... significa que Ella es el recurso en estos difíciles tiempos que se inician a partir de entonces. "Haz acuñar una medalla conforme a este modelo. Las personas que la llevan con confianza recibirán abundantes gracias". Miremos la Medalla y descubramos en sus dos caras que se complementan el Mensaje esencial del Misterio de la salvación. María Inmaculada, Madre de los hombres. María, mensajera, de la ternura de Dios, se muestra en pie. Viene hacia nosotros con las manos abiertas y en actitud de acogida. María es la sin pecado. Por eso aplasta la cabeza de la serpiente. Se lee una oración "Oh María sin pecado concebida rogad por nosotros que recurrimos a vos". Nos da a conocer que es la Inmaculada Concepción. El proyecto de amor de Dios hacia los hombres. La M coronada por la cruz: María esta íntimamente unida al misterio de la Pasión y de la Cruz de su Hijo, desde el Pesebre hasta el Calvario. Dos corazones: el de Jesús y el de María. Representan la fuerza del amor que llega hasta la entrega total. María entró plenamente en ese Misterio de Amor de nuestra redención. Doce estrellas: Jesús estableció su Iglesia sobre el fundamento de Pedro y sus Apóstoles. María Estrella de la Evangelización. Los fieles la llaman "Medalla Milagrosa" proclamando así que es un signo, el signo de la protección maternal de María. Entre otras cosas, Nuestra Santa Madre nos enseña: Su Inmaculada Concepción, que ella revela por primera vez al mundo y que confirmará en Lourdes el 25 de marzo de 1858. Su Intercesión ,cerca de su Hijo. María es la suplicante suprema de la humanidad. Con Él y por Él, Ella intercede sin cesar por nosotros. Portar y aceptar la medalla es proclamar nuestra fe en la súplica omnipotente de nuestra Medianera Inmaculada cerca de Cristo. Por la mediación de la Santa Medalla se obtienen innumerables gracias de conversión, de protección y de curaciones. Hay innumerables testimonios de personas que han mejorados de graves enfermedades, como el cáncer y otras. También la Santísima Virgen ha ayudado a muchos matrimonios, imposibilitados de tener un hijo. En fin, son miles los casos que se pueden constatar de la intersección de nuestra Madre. Nacida Sor Catalina Labouré, con lo mejor del año (mayo) de 1806, fue toda su vida sencilla y aromosa flor: galardonada en sus días con abundante rocío del Cielo. Tierna devoción a María, su aliento de toda hora. Muy niña (9 años) perdió a su madre. Fue entonces, cuando una criada de la granja la sorprendió encaramada sobre una mesa, y abrazando con todo el poder de sus, aún débiles brazos, a una imagen de la Señora. La iglesia parroquial de Moutiers -Saint Jean- fue testigo de sus anhelos eucarísticos. Desde el día de su primera Comunión (1818) se hizo "mística de todo en todo", cual decía con donaire su buena hermana Tonina. Por dos años hubo de luchar con el ingenuo rigor de su padre; para al fin, ingresar el 21 del mes de abril de 1830 en el Noviciado de las Hijas de la Caridad en París. Ya en el Noviciado, comenzó a gozar favores extraordinarios del Cielo. O Vergine Immacolata, che ci hai fatto dono della tua Medaglia, quale rimedio a tanti mali spirituali e corporali che ci affliggono, come difesa delle anime, medicina dei corpi e conforto di tutti i miseri, ecco che noi la stringiamo riconoscenti sul nostro cuore e ti domandiamo per essa di esaudire la nostra preghiera. Ave Maria. O Maria concepita senza peccato, prega per noi che ricorriamo a Te. (tre volte) . A la fin de chaque série de 1 Notre Père et 4 Je vous salue Marie , réciter 1 Gloire au Père.